Best of Himachal provides Volvo reservations for Shimla, Manali, Dharamsala, Dalhousie and various other destinations. 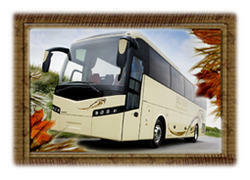 Volvo Buses provide the luxuriously comfortable travel to all over Himachal. Ticketing arrangements are also done for Local Sight seeing at important destinations. Do you want to travel anywhere in Himachal Pradesh or Kashmir We are a travel company and own a fleet of buses, which we operate in HP and Kashmir region. We also have associations with many reputed bus operators and can provide you discounted tickets to travel anywhere in these regions via deluxe, economy, A/C, non A/C buses etc. Our Agency provides Ac/Non Ac Buses, volvos, Tata and traveller for our customers.We Provide all these services to our customers according to their need and the budget. You can get any type of bus service at any time.